The aircraft carrier USS Nimitz (CVN 68) welcomed five sailors from the Indian Navy and four sailors from the Japan Maritime Self-Defense Force (JMSDF) aboard Nimitz, July 13 through July 17, as a part of Exercise Malabar 2017, in the Bay of Bengal. 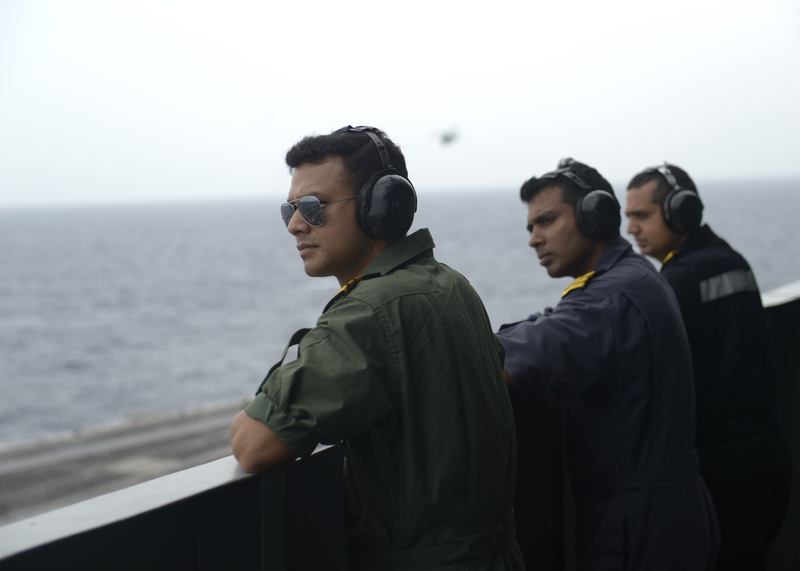 The Indian and Japanese sailors were shown around the ship over the course of four days to improve partnerships with U.S. Navy Sailors and learn about the capabilities of Nimitz and her crew. The foreign sailors visited the flight deck, weapons magazines, bridge, fuel pump rooms and the hangar bays to observe a replenishment-at-sea. They also met with Rear Adm. Bill Byrne, commander of Carrier Strike Group (CSG) 11 in his in-port cabin. The Indian and Japanese sailors were able to interact with Nimitz Sailors and learn about the different departments and the functions they serve aboard Nimitz during their stay. The foreign sailors spent the majority of their time touring the ship with U.S. Navy Cmdr. Jason Thompson, safety officer aboard Nimitz and a native of El Paso, Texas. This interaction was a part of the at-sea portion of Malabar 2017. The at-sea portion was designed to advance military-to-military coordination and capacity to plan and execute tactical operations in a multinational environment. The Nimitz Carrier Strike Group is currently underway participating in Malabar 2017. The exercise is the latest in a continuing series involving the Indian Navy, JMSDF and U.S. Navy that has grown in scope and complexity over the years to address the variety of shared threats to maritime security in the Indo-Asia-Pacific region.